With an action-packed Mobile World Congress behind us, HARMAN continued the momentum by revealing a range of breakthrough in-car audio and infotainment experiences at the Geneva International Motor Show 2019. At this event in Switzerland, HARMAN’s Global Vice President of Car Audio Marketing, Bill Wyman, discussed how the automotive industry is evolving its value proposition for consumers, shifting gears from RPM to EPM or ‘Experiences Per Mile’. Here’s a closer look at the key highlights from Bill’s presentation that uncover where the future of automotive is heading. The global automotive industry is on the verge of disruption, primarily due to advancements in areas like connectivity, autonomous driving, shared mobility and the future of digital marketing. These trends will shift markets and revenue pools, change the nature of mobility and build new avenues for competition and cooperation. Bill’s presentation offered a deep dive on each trend and shared his insights on their role in the automotive industry. Trend 1: Connectivity - An estimated 21 million connected cars are on today’s roads, and that number will only continue to grow. Superior connectivity in vehicles will be critical as the industry heads towards full autonomy, which will also demand enhanced communication – including V2I (Vehicle to Infrastructure), V2V (Vehicle to Vehicle), V2C (Vehicle to Cloud), V2P (Vehicle to Pedestrian) and V2X (Vehicle to Everything). Trend 2: Autonomous Driving - Transportation in the U.S. has seen dramatic changes over 400 years – from horse-drawn wagons to streetcars, from the first American subway to the first car-sharing service. People who used horses and carriages as a means of transportation in the 15th century probably would have laughed at the idea of a vehicle driving on its own. Today, in the 21st century, industry analysts are forecasting that 250 million vehicles with built-in autonomous features will be on the road by 2020. This shift is happening quickly, and it will inherently change our relationship to our cars and their role in our daily lives. Trend 3: Shared Driving - 2018 was another big year for ride-sharing services, like Uber and Lyft, as they continued to disrupt the broader mobility market. It has been a little more than five years since passengers began ordering cars through smartphones apps, challenging traditional taxi operations. With continuous advancements in technologies that improve in-car experiences and personalization, 2019 could be just the beginning of ride-sharing's takeover of the mobility market. Trend 4: The Car as A New Avenue for Digital Marketing – With the advent of these ultra-connected self-driving vehicles, a whole new marketing avenue becomes available that can deliver hyper-personalized content and offers at the precise time they are relevant for the consumer..Consider this scenario: through it’s navigation capabilities, your car knows that you are headed to the supermarket, and since it’s connected to your calendar, it also knows that you are planning a barbecue this weekend. With this information, it delivers offers on party supplies, recipe ingredients and clean-up tools that you’ll need for the occaision. UBS predicts the number of vehicles on the road will reduce to half of its current levels by 2050 due to autonomous vehicles and shared driving. This concept can be daunting to automakers as their revenue could significantly decrease. However, the opportunities can outweigh the challenges. Autonomy and the shared economy will unlock time. This is a key reason why the value of a vehicle is moving from RPM to EPM – making it critical that automakers provide consumers with enhanced in-cabin experiences to drive more value in the vehicle. Once vehicles are able to drive on their own, passengers can leverage their free time at their leisure. For instance, passengers have the freedom and ability to take a nap on a long trip, watch a movie, or even work through the commute. 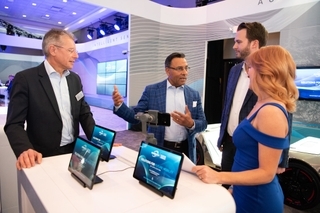 As a connected technologies powerhouse, HARMAN has been leading the charge in democratizing vehicle experiences through solutions that help automakers choose technologies to provide greater connectivity and value within their vehicles. At CES 2016, we announced our collaboration with Microsoft to integrate key elements of Microsoft Office 365 productivity suite capabilities into HARMAN’s infotainment systems, allowing attendees to see first-hand how we raise the standard for the in-car experience.